London, UK: Privately Printed, 1894. Paperback. Very Good. Size=5.5"x7.5". 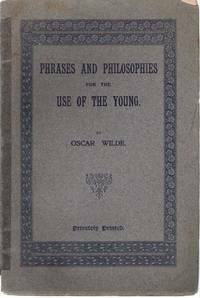 (full book description) Privately Printed, London, UK, 1894. Limited Edition VG, Paperback, Size=5.5"x7.5", 11pgs. Grey paper boards, blue decorated front cover border design. Tradesize paperback. Copy #68 of 75 numbered copies privately printed. 1/2" cover tear head of spine, 1/16" x 3/8" chip front cover top fore-edge corner, o.w. clean, bright & tight. No ink names, bookplates, etc. Text in Fine Like New condition. Probably a pirated edition, but scarce more the less. [Limited Editions; Aphorisms; Pirated Editions] SELLING WORLDWIDE SINCE 1987. WE ALWAYS PACK WITH GREAT CARE!